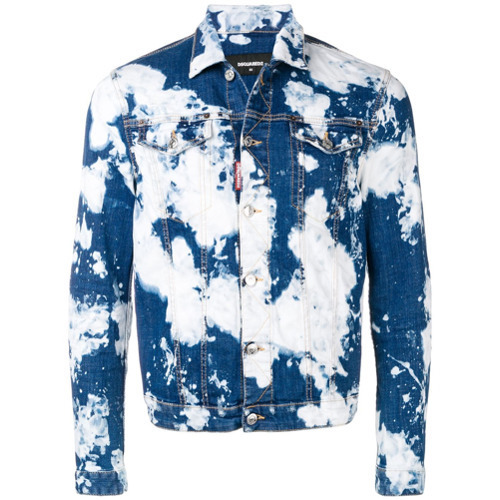 If you're on a mission for a casual yet seriously stylish outfit, opt for a DSQUARED2 denim jacket and navy jeans. Both of these pieces are super comfy and will look great when paired together. Lift up your ensemble with brown leather brogue boots. 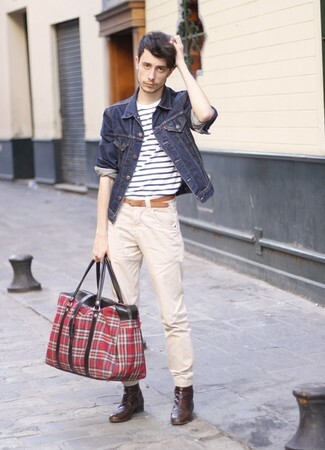 If you're searching for a casual yet on-trend look, opt for a DSQUARED2 denim jacket and khaki skinny jeans. As well as super comfy, these two items look great paired together. For something more on the daring side to round off this outfit, opt for a pair of dark brown snow boots. 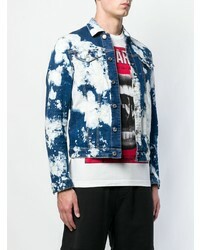 If you're on the lookout for a casual yet on-trend look, team a DSQUARED2 denim jacket with charcoal jeans. These two garments are totally comfortable and they also look stunning when worn together. A pair of white low top sneakers will seamlessly integrate within a variety of looks. 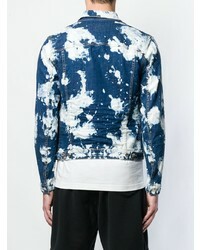 If you're looking for a casual yet on-trend look, pair a DSQUARED2 denim jacket with navy jeans. As well as very comfortable, both of these garments look fabulous paired together. Finish off your outfit with white leather low top sneakers. 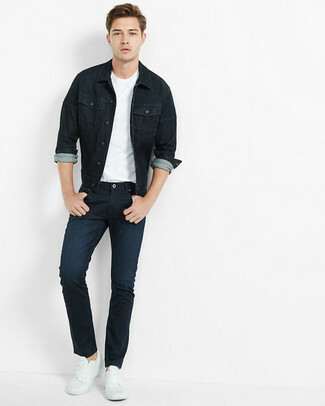 No matter where you find yourself over the course of the day, you'll be stylishly prepared in this relaxed casual combo of a DSQUARED2 Denim Jacket from farfetch.com and mustard chinos. If not sure as to what to wear on the shoe front, stick to brown suede desert boots. If you're on the lookout for a casual yet stylish outfit, opt for a DSQUARED2 denim jacket and khaki chinos. As well as super comfortable, these items look amazing paired together. Brown leather chelsea boots will add a touch of polish to an otherwise low-key look. Go for a classic style in a DSQUARED2 denim jacket and charcoal dress pants. Grab a pair of navy plimsolls to make the outfit current. 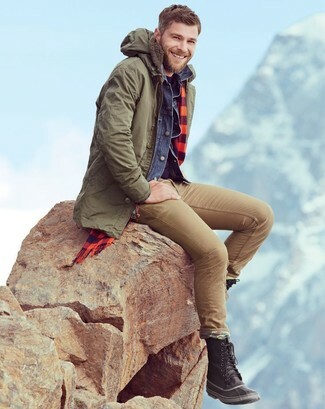 If you're hunting for a casual yet on-trend look, reach for a DSQUARED2 denim jacket and khaki chinos. Both garments are very comfy and will look great together. 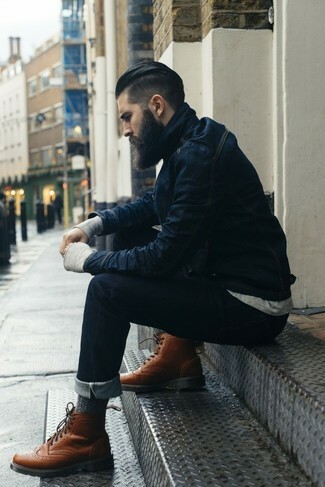 To add more class to your ensemble, finish off with dark brown leather casual boots. 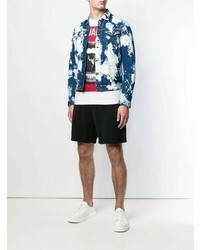 If you're searching for a casual yet seriously stylish look, dress in a DSQUARED2 denim jacket from farfetch.com and black jeans. As well as totally comfy, both of these garments look stunning together. 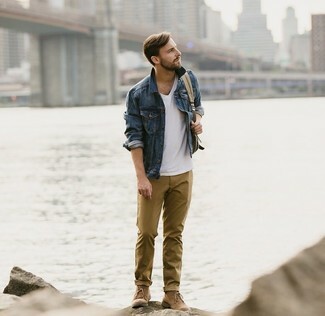 Consider brown suede desert boots as the glue that will bring your outfit together.